Gosh I love a good chocolate cake. I stress good chocolate cake. I like them on the dense side and nice and moist and rich. I especially love my chocolate cake topped of with chocolate ganache although to be honest, I am equally happy with a chocolate glace icing. I must also add that I am not a big fan of chocolate buttercream icing on a chocolate cake. Not sure why that is. Perhaps it is a little to light in flavour when paired with a dark, rich and moist chocolate cake. Anywa, enough about my chocolate cake and icing preferences. 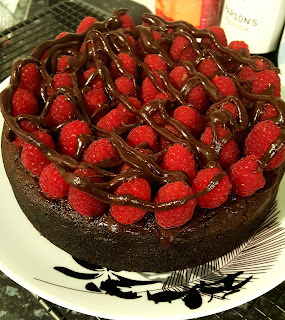 Today I am sharing with you one of my favourite chocolate cake recipes - Rich Chocolate Cake with Chocolate Ganache. I'm not entirely sure that that title does this cake justice. It is such a wonderfully delicious cake that it really deserves a special, attention grabbing name. However, I am not a particularly creative person, so this name will have to do. Cake1. Preheat oven to 150 degrees fan forced. Grease and line the base and sides of a 22cm round cake tin with baking paper. 2. Place broken up chocolate into the jug with the kneading blade. Set Speed 3, Temp 85 for 3min 30sec to melt the chocolate. Continue in 30 second increments if not fully melted. 3. Place all other ingredients in the jug, in the order they are listed, with the kneading blade. 4. Select pastry programme P1. 5. 30 seconds before the programme finishes, stop the machine and scrape down the sides and around the blade with a spatula. Restart the machine to complete the programme. 6. Once the programme is complete, tip the cake mixture into the prepared tin, Smooth over the top. 7. Bake in oven for 60 - 75 minutes depending on your oven. 8. Remove cake from the oven and stand in the tin for 15 minutes before turning out topside up to cool. 2. Add cream ingredients to the jug. To assemble the cake, spread 3/4 of the chocolate ganache over the top of the cake. Cover the top of the cake (as per the picture) with raspberries bottoms up. Place the remaining ganache into a piping bag or into a small zip lock bag with a corner cut off and drizzle chocolate over the top of the raspberries.